The Lotus Elise accelerates from 0-60 mph in six seconds and can reach top speeds as high as 150mph, making it an instant favourite with young car lovers when it was introduced in 1996 and ever since. 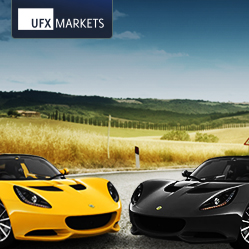 UFXMarkets Traders have their sights set on a 3-door, 6-speed Aspen White Lotus Elise with a 4-cylinder, 1.6 litre DOHC engine. Traders will earn a guess for every five positions they open before midnight on May 31st, at which point the really kicks into first gear as Traders try to predict the closing price of either Gold or Oil at the end of the first trading week in June. There’s still plenty of time to get involved and just five trades could be enough to win the car. Enter the UFXMarkets Lotus Elise Trading Competition at ufxmarkets.com/topgear.